Create unique forms using custom form fields. 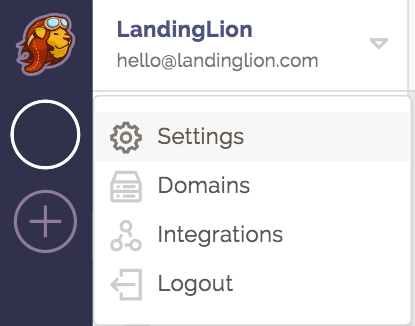 If you're new to Landing Lion, you'll notice that you'll only have stock form fields to use in your forms. 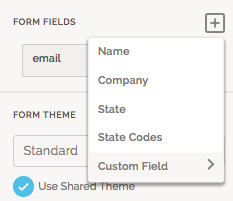 You can add, create, and edit different types of custom form fields. Hidden - allows you to include information that visitors cannot see. The information you enter in the hidden field is included when the form is submitted. Hidden form fields are typically used to communicate data to an integrated application (ie. MailChimp, Salesforce, etc). To add a custom form field, first select the form component you've added on the page. In the Right Pane under "Form Fields" click the grey "＋" to access the dropdown menu. 2. 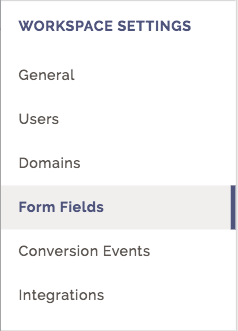 Click "Custom Field" from the dropdown menu to access the available field types for the custom field. Select a form field type from this list. 3. A newly added form field is incomplete — it needs an ID. To add a new custom Field ID, click the new form field and type in what you want the ID to be. 💡Form fields that are missing an ID are highlighted in red. We use IDs to organize your form data in Reports. If no ID is set, then we will not be able to track that form field's data. 1. 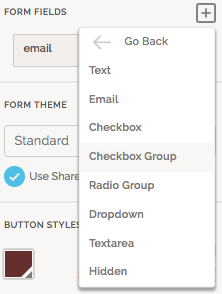 To manage custom form fields outside of the Page Builder, go to your Settings in the Main Dropdown. 3. Click the blue "+ FORM FIELD" button, give the New Form Field an ID (Form Field Name), and click "CREATE". You can also edit and delete any custom form fields that have been created within this workspace.